Here in Anchorage Alaska at Camai Bed and Breakfast our rhubarb plants are thriving along with many flowers, vegetables and hanging baskets. Today is summer solstice and a warm sunny day. We can practically see the plants growing! Breakfast this morning started with a fruit plate. 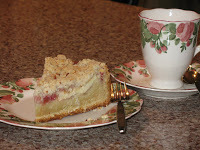 Here is the recipe for a rhubarb coffee cake that was served with Marne’s Easy Egg dish as well as sausage this morning. Preheat oven to 350 degree. Grease spring form 10X3” pan. Lightly flour. In a sauce pan cook over lowest heat stirring frequently. Cook until rhubarb is just tender. Remove from heat and cool. Soften cream cheese. Mix in sugar. Stir in egg. Set aside. Mix flour, sugar, and almonds. Cut in butter. Set aside. Mix flour, sugar, baking powder, baking soda, and salt. Cut in butter. Mix in sour cream, egg and almond extract. Pour cake into prepared pan. Spread cream cheese layer evenly over cake. Spread 1 cup rhubarb sauce over cream cheese. Sprinkle with cake topping. Bake for 50-60 minutes. Let cool for 15 minutes before placing on serving dish and removing pan. 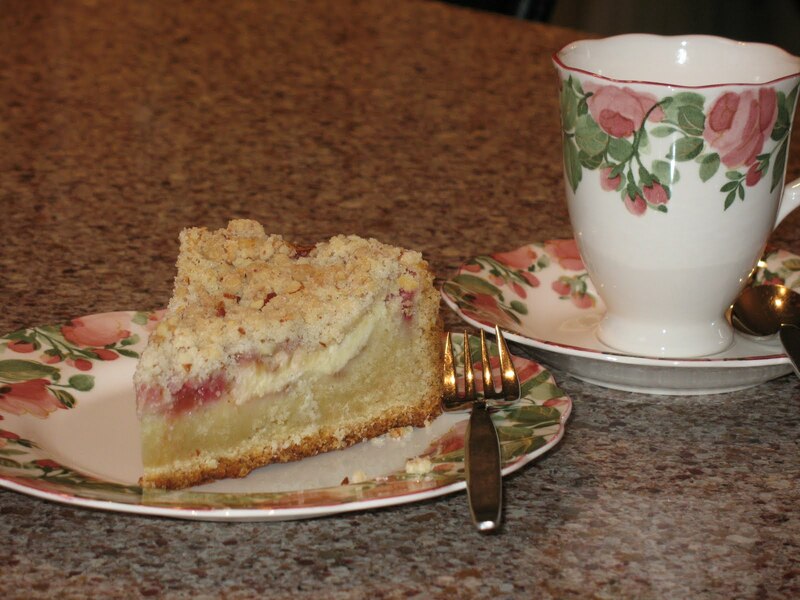 This entry was posted in Recipe and tagged breakfast, recipes, rhubarb by admin. Bookmark the permalink.